At Tara's apartment, Steed and Tara enjoy faux sun on a faux beach in the middle of her living room. In an attempt to wreck a peace conference, a diabolical mastermind utilizes "instant plastic surgery" to create a duplicate of Steed. His only mistake was not keeping a closer eye on the original while he had him in his clutches, as the real Steed knocks out his jail keeper and prepares a little surprise for the army of enemy agents about to descend on the conference. What keeps this one from hitting the four-bowler mark for me is Ray McAnally's obnoxious accent—that, and Mother's mega-goofy hideout. It is otherwise quite decent, with a fresh premise and a number of noteworthy aspects, such as a new "partner" for Tara (aren't they the cutest couple? ), and a startlingly gross Steed that went wrong. 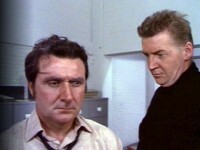 The original plans to shoot this episode in Spain proved unworkable; as a result, Ray McAnally improvised most of his lines. It must be noted that there are very strong similarities to certain plot details in The Outer Limits, "The Hundred Days of the Dragon," which aired in the US on 23 September 1963. Tyke's Water Lake is pressed into service yet again; On Location provides a recent view. Car chases filmed at Burnham Beeches. Caldecote Towers, Bushey, and Ye Olde Sun Hotel in Northaw served as the conference center. Tara jumps off of the bridge at Grove Park, Watford.